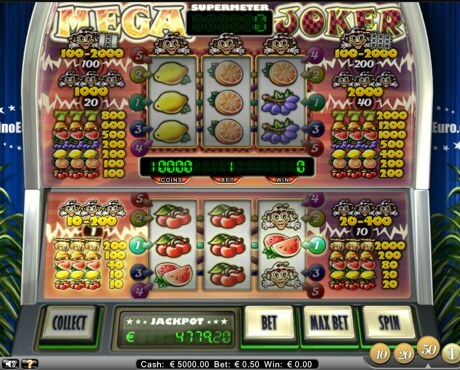 Mega Joker is a 5-line, 10-coin slot machine game with two 3x3 reels, featuring basic mode, supermeter mode, and progressive jackpot. Bet 1 or 10 coins in the basic mode using one of the available coin values from 1c up to €1. At bet 10 coins per spin, all 5 bet lines are active, and you can collect your winnings or play in the supermeter mode. 3 jokers on a bet line give a mystery win between 20 and 400 coins. MAX BET plays the game at the maximum bet lines, highest bet level, and the pre-selected coin value. If you play max bet and win, you have the option to enter Supermeter mode. Your win must occur with fewer than 2,000 coins in the main game, played at max bet of 10 cins and all 5 paylines active. Bet 20, 40, 100, or 200 coins in the supermeter mode, at the pre-selected coin value. All supermeter credits are stored in the supermeter. The credits can be collected after any spin and returned to the basic game. Supermeter wins are paid out according to the highlighted paytable that displays to the left and right of the supermeter reels. At bet 200, one or more jokers gives a mystery win between 100 and 2,000 coins for each joker. At bet 100, a joker in the middle reel gives a mystery win of 100 to 2,000 coins. At bet 40, 100 and 200, 3 jokers on a payline gives a mystery win of 2,000 coins. At bet 20, 3 jokers on a bet line give a mystery win of 1,000 coins. Maximum win in the supermeter mode is 2,000 coins. The Jackpot is a progressive jackpot, where every time the game is played by a player a portion of the bet (3%) is added to the Jackpot. The largest ever hit Mega Joker jackpot of €80,462.00 was hit by player Oskar on May 12, 2013 at Betsafe Casino. The Mega Joker jackpot is the same across all Net Entertainment casinos.